Irish folk legend Andy Irvine (Planxty, Sweeney’s Men, Patrick Street) is coming to our pocket of regional Victoria to launch his latest album. 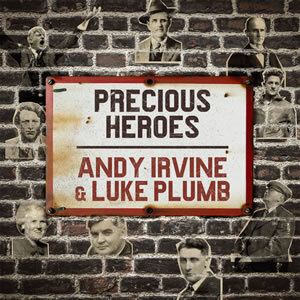 Made in collaboration with Australian Luke Plumb, Precious Heroes is a tribute to his musical and political heroes who ‘‘stood up for the working people’’. While the album cover is littered with the faces of trade unionists, rabble-rousers and singers, Irvine’s greatest musical influence — Woody Guthrie — is an absentee. Irvine said for the first 15 years of his life he was looking for an unknown type of music which he could call his own. At this time, he said, rhythm and blues was enjoying a period of dominance before rock and roll took over, coinciding with the development of the 45 RPM record. ‘‘My friends all thought it was great . . . but it wasn’t me,’’ Irvine said. ‘‘Then I discovered Lonnie Donegan . . . and on the back of one of his EPs, it said the song was written by Woody Guthrie. So one day I was walking down in the West End of London, and there in a small shop was More Songs by Woody Guthrie and Cisco Houston. Fast forward to 2016 and Irvine, already a fan of Luke Plumb’s work as a musician, decided to enlist the Australian’s help as producer after appreciating his work in fine-tuning Declaration — the latest album made by Kate Burke and Ruth Hazleton. Irvine said Plumb leaped at the opportunity to collaborate and the pair went on to transform the house of a friend travelling abroad into something of a DIY recording studio. ‘‘We put mattresses up against all the walls and windows to deaden the sound and Luke and his computer and his microphones were set up and I played and sang into it, which is the way it is these days,’’ Irvine said. Irvine said while his greatest musical influence has always been Woody Guthrie, he has never been able to write contemporary political songs like the American singer-songwriter. ‘‘It’s a shame . . . but I can’t do it . . . because you don’t know all the facts,’’ Irvine said. ‘‘So the songs that I write are about things that happened in the past, where nearly all the evidence you’re ever going to have is there. And that’s what a lot of these are — the strike in the coal mines in County Kilkenny and the Spanish Civil War. Andy Irvine and Luke Plumb are performing at Under the Sun Café in Strathbogie on March 17. For bookings phone 0427 317 694. Precious Heroes is out now.